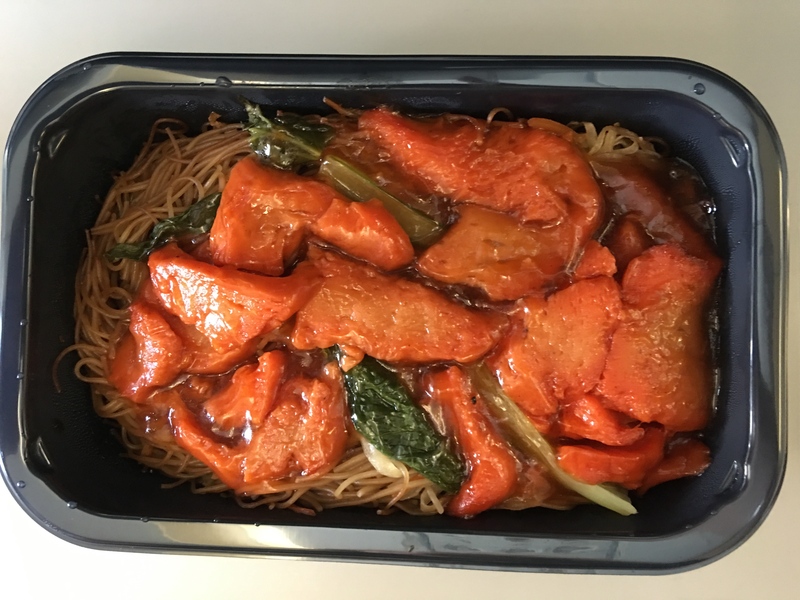 Budget Airline With Great Food – Is This Possible? We are flying from Malaysia after two glorious weeks here in Penang. Flying with a child means I always need to consider his needs, as there is nothing worse than an unhappy kid, and the inability to tend to their requirements mid-flight. Some of the things as a parent I need to consider include: how much luggage we take to ensure we are prepared for just about anything; where we sit on the plane; and how hungry or thirsty he might be once we are thousands of feet in the air. So with that in mind, I decided to pre-book a few excess kgs on our luggage, and I select a seat for him by the window. 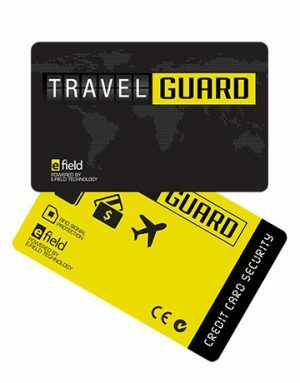 I’ve chosen budget airline TigerAir to fly with this time – with a life of permanent travel we like to save money where we can. Last time we used Scoot Airways and absolutely loved them, but as they don’t fly to our destination, we have chosen their sister airline TigerAir, who do. There is nothing worse than a kid who is hungry or thirsty and not having anything to satisfy them with. 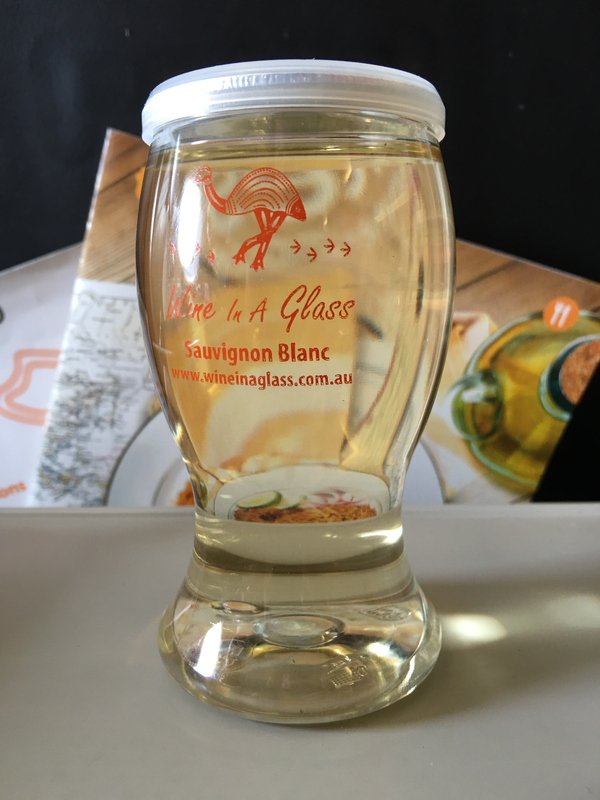 No longer can drinks be taken onboard by passengers on any flights, and with the hours it takes to get to an airport, and then wait for a flight, I find my child is usually hungry by the time we are soaring through the clouds. I also find that snacks ‘don’t cut it’, and do not replace the need for a complete meal for their growing bodies. So as we speed through the air thousands of feet above the earth, I am delighted when we are the first to be served food on our flight. 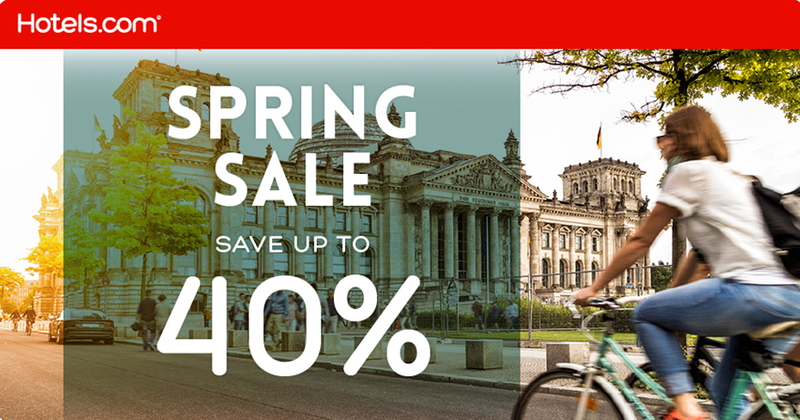 Explorason thinks we have VIP treatment, but the real reason is that I pre-booked our meals online. The man next to me looks really ‘miffed’ as our hot meals are passed over him, along with my lovely cup of coffee, and our cool drinks. He grabs his Tigerbites Menu from the seat pocket in front of him and starts flipping through the pages. He now has to wait until the passengers who pre-ordered get their meals first before he is served. 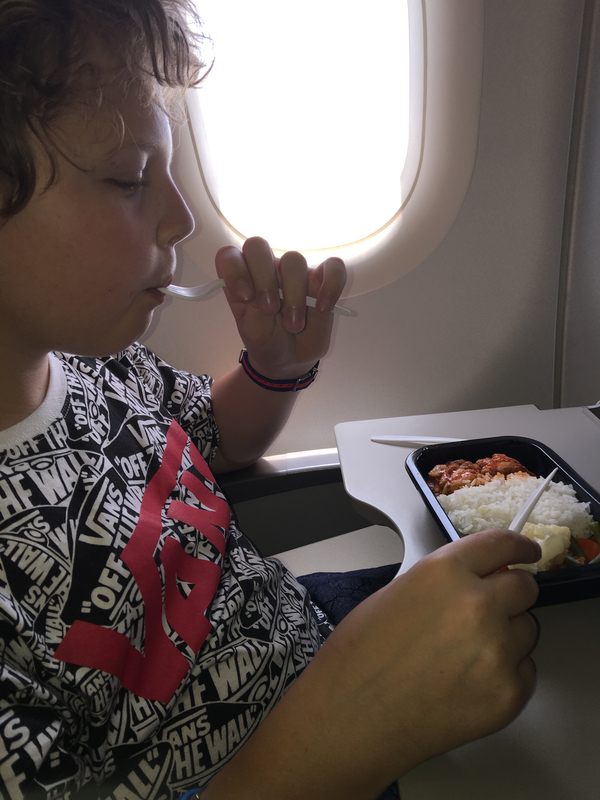 Kids can be fussy eaters, and I know when airline food arrives in its sealed container, it often can’t be presented as nicely as a restaurant meal, but obviously, the taste and nutritional value is what matters the most. So what did he order that was so fabulous? 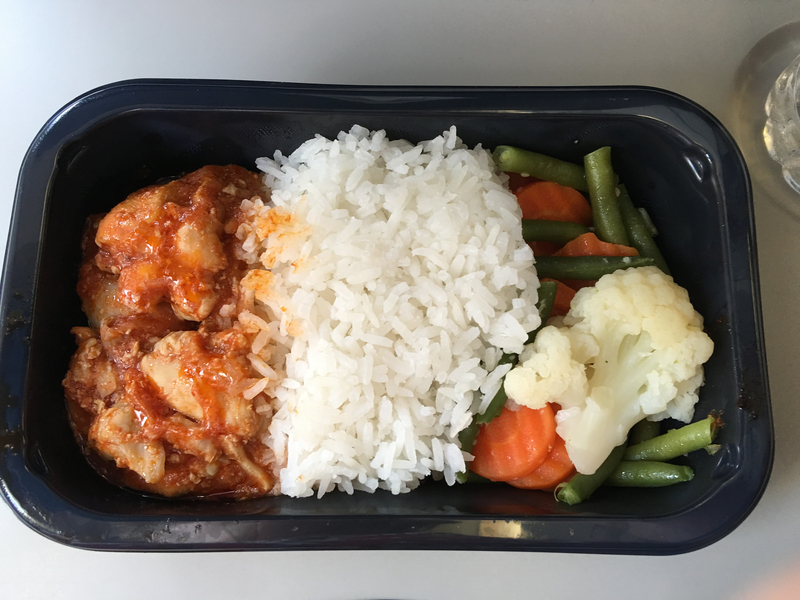 It was called Spicy Tomato Chicken with baby corn pieces dotted through it and fragrant jasmine rice. Served only very mildly spicy, he wasn’t even bothered by the zing to his meal at all, which was an added bonus. Asian food tends to have a bit of a kick to it, but this dish was just right for him as far as the spiciness goes. For just $12 this is pretty good value for a Budget Airline, and my eleven-year-old sits back contentedly at the end of the meal. 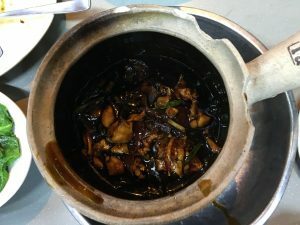 I ordered a pretty great Oriental Vegetarian Meal – it was also great! 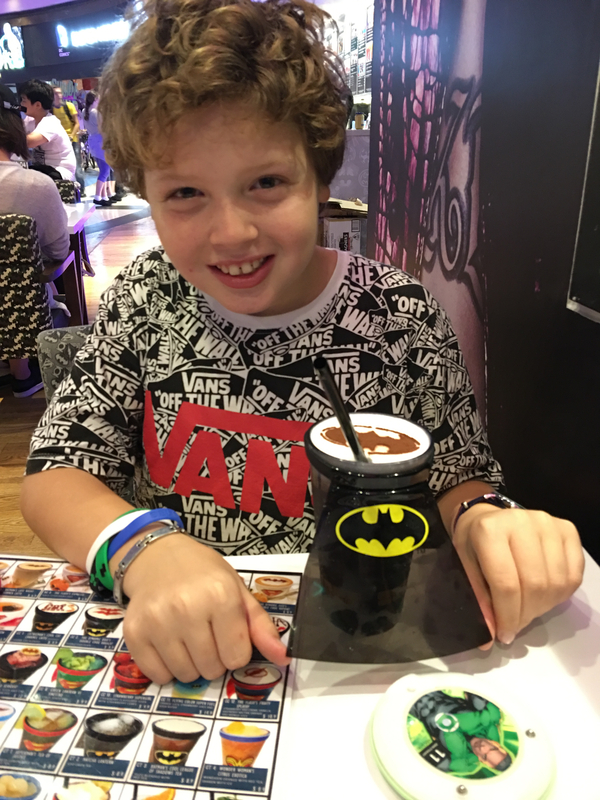 We arrived in Singapore, and with another hour’s transit to the hotel, I could relax as a Mum that my son would be satisfied until we went out to dinner. Dinner, in fact, proved to be a bit of a challenge. 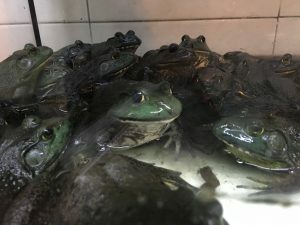 As we passed many Asian food restaurants, we saw tanks full of Bull-Frogs lining the street. 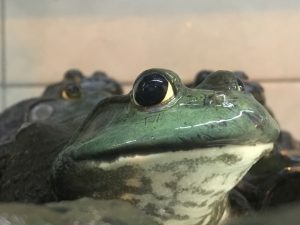 Oh no – locals were devouring Clay Pots of cooked frogs! At this point, I was really pleased that we had eaten on the plane. 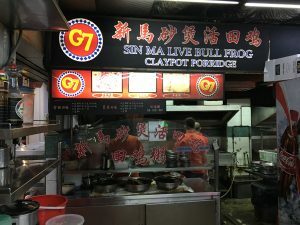 Sorry, but Bull-Frog was not our chosen cuisine for the night! We walked on and eventually caught the MRT to Town Hall where there is a massive Food Court. Ordering meals proved to take way longer than we planned, and we ended up not even having time for a proper dinner. 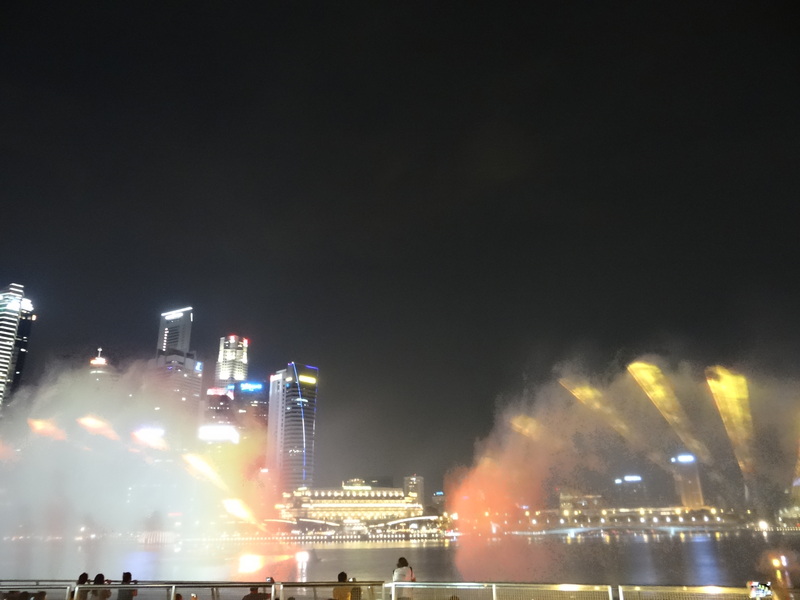 We were now on an agenda to watch the Marina Bay Sands Wonder Fall – a wonderful Laser and Water, Light and Sound Show. As it ended they finished with my favorite song ‘What A Wonderful World’ by Louis Armstrong. We sat on this balmy evening I realized how wonderful our life of travel really is. It is incredible that we started today in Malaysia, and we sit here tonight in Singapore and tomorrow we will be in Vietnam! This was a moment that no camera can capture – a wonderful moment of the heart. Marina Bay Sands Shopping Centre has a pretty massive food court, so finding a Batman and comic themed Restaurant was a winner to end the evening. 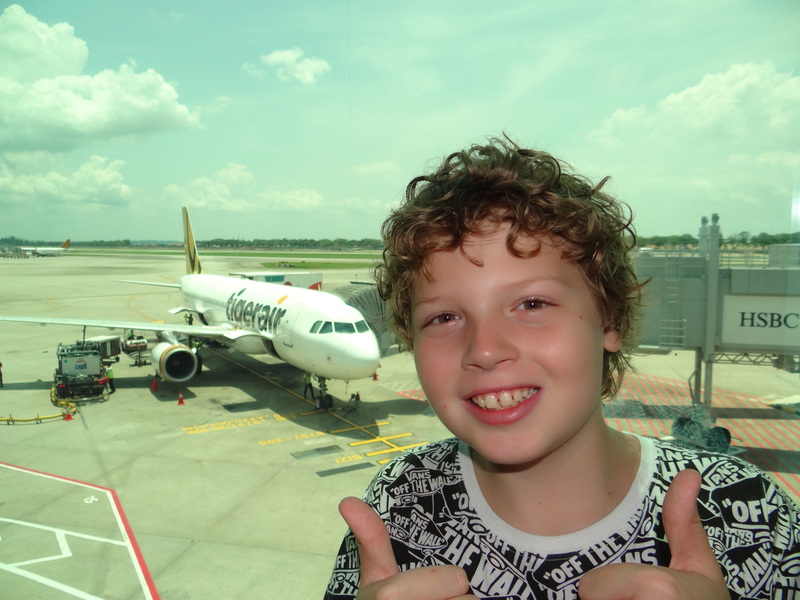 The next day we were booked with TigerAir to fly onto Vietnam. This was once again a lunchtime flight and we had only snacked on the ‘junk food’ options at the Changi Airport. Yet again our meals arrived promptly. It seemed no sooner that the seatbelt sign had been switched off, and they arrived. This time, I had selected a different meal each. Explorason was equally happy with his choice (another fabulous chicken dish), and so was I. My meal was complete with a lovely glass of Sauvignon Blanc from Australia. 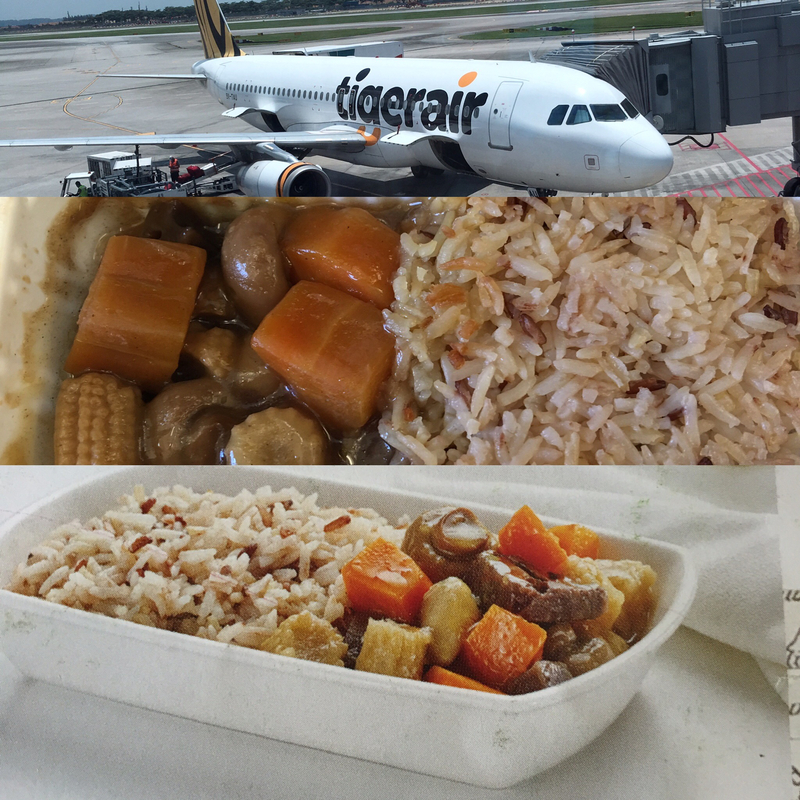 If you are considering using a budget airline to fly from Australia or within South-Eastern Asia, I’d love to recommend TigerAir. 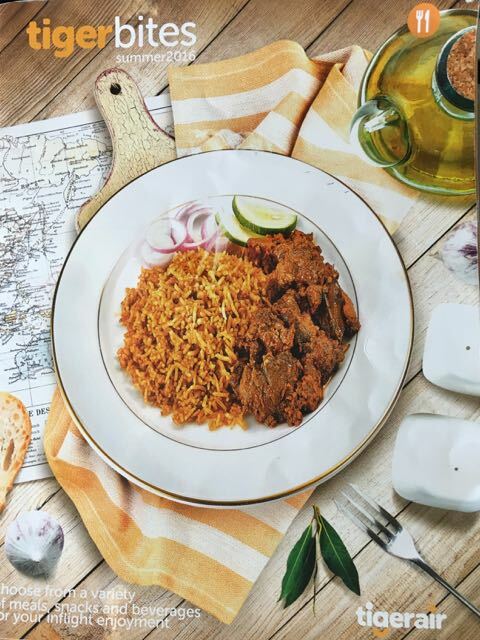 Fantastic food at an affordable price. Remember our tip to pre-book your meal too. You’ll be so pleased you did! Feeling Blue ? What A Load Of Rubbish ! I’m impressed. I usually scrounge in the airport for food because airplane food in the US, even on legacy carriers, is not something to look forward to. OTOH, we can still bring our own beverages purchased after security on planes. 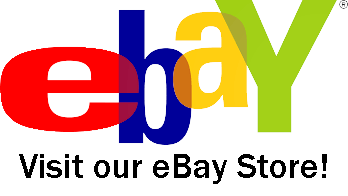 Wow – that is good re the drinks. We can’t. In Hawaii, they took my food off me as I boarded the plane too. I think it just depends where.